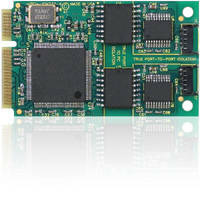 Mini PCI Express Cards withstand harsh environments. Measuring 30 x 51 mm, mPCIe-ICM Series offers 4 or 2 ports of isolated RS232 serial communications. Cards feature Tru-Iso™ 1.5 kV isolation port-to-computer and 500 V isolation port-to-port on all signals at I/O connectors. Designed with type 16C950 UARTS, cards use 128 byte transmit/receive FIFO buffers to minimize CPU loading. RoHS-compliant units operate from -40 to +85Â°C, offer Â±15 kV ESD protection of all signal pins, and support data communication speeds up to 1 Mbps simultaneously. SAN DIEGO, CA — ACCES I/O Products, Inc., has announced the release of a new family of PCI Express Mini Cards—the mPCIe-ICM Series. These isolated serial communication cards measure just 30 x 51 mm and feature a selection of 4 or 2 ports of isolated RS232 serial communications. 1.5kV isolation is provided port-to-computer and 500V isolation port-to-port on ALL signals at the I/O connectors. The mPCIe-ICM cards have been designed for use in harsh and rugged environments such as military and defense along with applications such as health and medical, point of sale systems, kiosk design, retail, hospitality, automation, and gaming. The RS232 ports provided by the card are 100% compatible with every other industry-standard serial COM device, supporting TX, RX, RTS, and CTS. The card provides ±15kV ESD protection on all signal pins to protect against costly damage to sensitive electronic devices due to electrostatic discharge. In addition, they provide Tru-Iso™ port-to-port and port-to-PC isolation. The serial ports on the device are accessed using a low-profile, latching, 5-pin Hirose connector. Optional breakout cables are available, and bring each port connection to a panel-mountable DB9-M with an industry compatible RS232 pin-out. The mPCIe-ICM cards were designed using type 16C950 UARTS and use 128-byte transmit/receive FIFO buffers to decrease CPU loading and protect against lost data in multitasking systems. New systems can continue to interface with legacy serial peripherals, yet benefit from the use of the high performance PCI Express bus. The cards are fully software compatible with current PCI 16550 type UART applications and allow for users to maintain backward compatibility. For additional information, readers can view a data sheet and manual for the new mPCIe-ICM family by visiting the product webpage at www.accesio.com/mpcie-icm232-4. Our Tru-Iso™ products are designed under IPC-221B. The circuit is isolated with a ≥300mil gap between all signal and plane layers between the ports and the PC, and a ≥ 100mil gap port to port. These gaps are rated under IPC-221B at 1500V (Port to PC) and 500V (Port to Port). Our circuit uses a chip-level high-frequency DC-DC isolator which is rated at 2500VRMS for 1 minute under UL 1577. This isolation component has an over 50 year isolation lifespan even if the isolation voltage potential is in excess of 350 volts AC. For over 25 years, ACCES I/O Products, Inc. has supplied an extensive range of analog, digital, serial communication, and isolated I/O boards and solutions. ACCES also offers complete systems, integration services and enclosures with a quick turn-around on custom projects including software. ACCES products are designed for use with Ethernet, PCI Express, Mini PCI Express, USB, USB/104, USB/PICO, PC/104, PCI, Ethernet and ISA, as well as distributed, wireless I/O, and computer-on-module (COM) form factors. All hardware comes with a 30-day, no-risk return policy and a three-year warranty. For further information, visit the company’s web site at www.accesio.com.